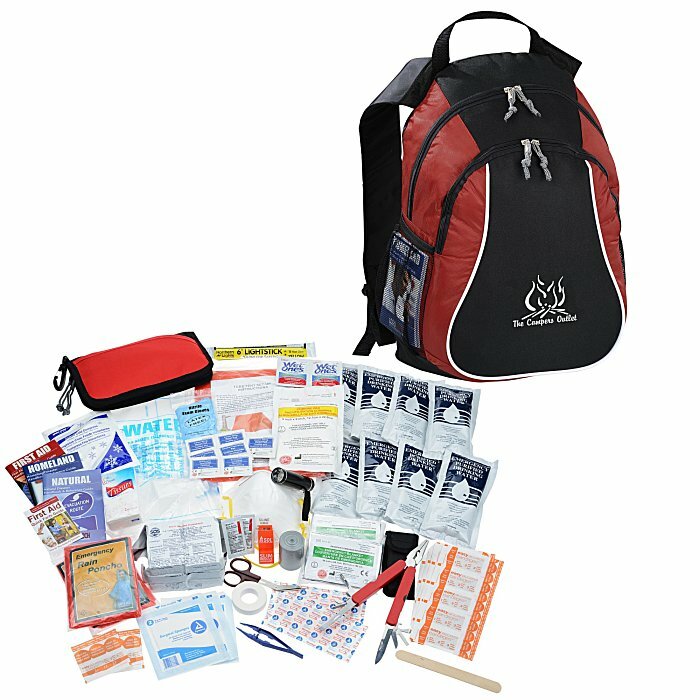 Give them the tools they need with this logo'd emergency kit. This survival backpack helps prepare them for unexpected trouble with more than 75 items for emergency situations! Contains enough water, food and first aid items to help get them through nearly any dilemma. Small zippered pocket on the front of the bag holds the first-aid kit; includes first aid guide, cold compress, bandages, gauze, tape, creams, alcohol pads, antiseptic wipes, wash-up towelettes, nitrile gloves, scissors, tweezers, XL bandages, ABD gauze pad and finger splint. First aid pouch features zipper-closure and a carabiner clip for easy and convenient portability without the backpack. Open the large zippered pocket to reveal emergency water packets, homeland and natural disaster reference guides, 8-liter expandable water bottle, tube tent, food bars, whistle, duct tape, disposable respirators, heat-reflective survival blankets, multifunction knife, flashlight, glow stick, tissues and ponchos. Black mesh pocket on the side of the backpack holds additional supplies (not included). Offers adjustable, padded shoulder straps and top-grab carrying handle. Size: 15" x 12" x 8". Your price includes a one-color imprint on the front pocket of the backpack. Additional color available for an extra charge.